– Starbucks gets you through the guest list, wine gets you through the seating chart. Price Cutter has both! – Flowers from Ruby’s Market help rack up Daughter-In-Law points with Mom, a 6-pack helps with Dad. But everyone loves a sweet treat from the bakery at Ruby’s Market! – Snacks and drinks for the party bus are a MUST! Order a sandwich tray from Price Cutter or Ruby’s deli to keep everyone smiling for pictures! – Out of town guests love a good welcome basket! Ruby’s Market offers several products from local vendors – why not include something made right here in the 417? – Consider small bags of chocolate covered almonds or espresso beans as party favors! Buy in bulk from Ruby’s Market to save you time and money! – Brunch themed showers are trending! 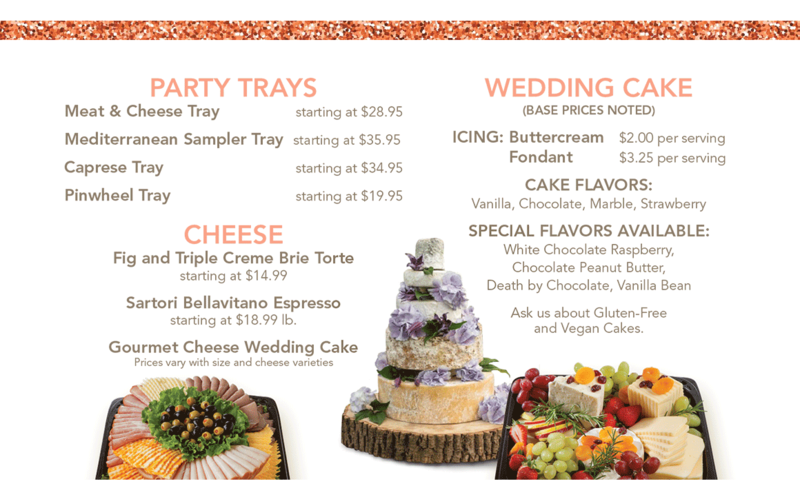 Keep it simple by ordering a few fruit and pastry trays from Price Cutter for the party. The only work left for you will be popping the champagne! – Don’t forget about ordering boutonnieres for the wedding officiant, ushers, grandfathers, and ring bearers! Keep everyone looking sharp and feel included in the day! – Floral and greenery garlands are hot right now! Consider adding garland to the top of your seating chart, the gift table, the head table, the bar – possibilities are endless! – Consider a crown made of flowers or greenery for the bridesmaids and flower girls. Mix and match colors and textures for a unique fashion accessory! – Try featuring a small wedding cake at each guest table, encouraging everyone to mingle if they want a different flavor. The happy couple cuts into a personal cake in front of everyone, and cake is served family style! – Cake not your thing? Price Cutter offers a gourmet tiered “cake” made out of cheese! Offer a dessert charcuterie spread instead of traditional cake for a unique spin! – Food bars are a hot trend for weddings! 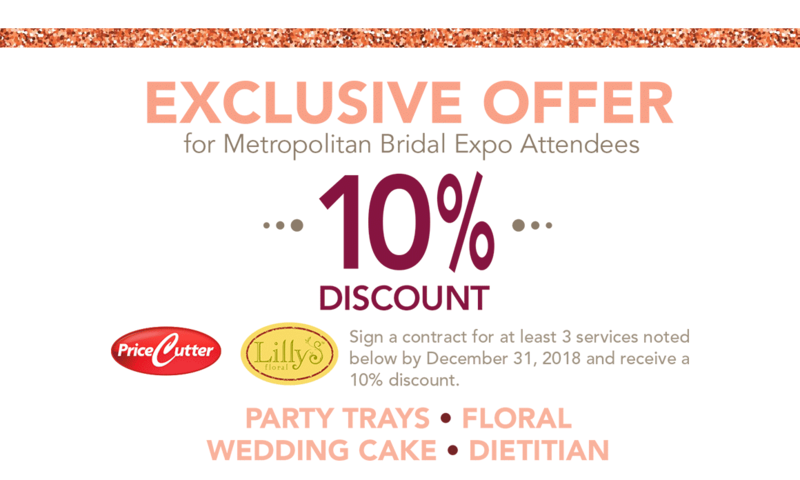 Consider a fancy cheese bar including Fig and Triple Crème Brie Torte, Sartori Bellavitano Espresso, or even a full gourmet cheese wedding cake for a unique theme! – For the day after, serve a light meal while you open your wedding presents with family and friends! Plan ahead, and order a few party trays from the Price Cutter Deli to keep things easy! – Give your guests a sweet surprise at the end of the night with a donut and coffee bar! Clyde’s donuts from Price Cutter bakery are a delicious finish to the perfect day.